Holiday-related web searches have tailed off considerably. In February there were just 1.2 million online searches from UK consumers for holidays, compared to 2.9 million in November last year. On the plus side, tour operators in the UK have been reporting a boom in holiday bookings to warmer climes including the Mediterranean. March’s cold snap is considered to be the cause. 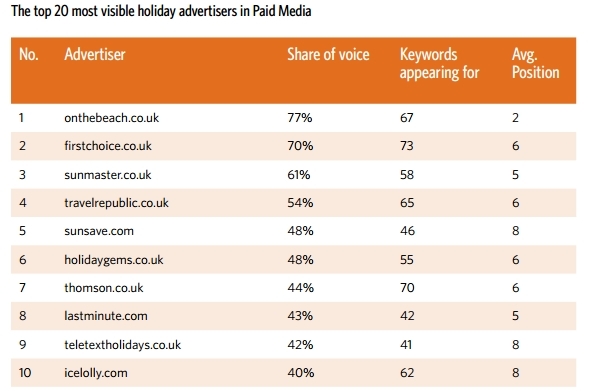 Digital marketing agency, Greenlight, has released its latest holiday sector report. In it, holiday terms such as ‘last minute holidays’, ‘all inclusive holidays’ and ‘cheap all inclusive holidays’ contributed 55% of all holiday-associated queries. 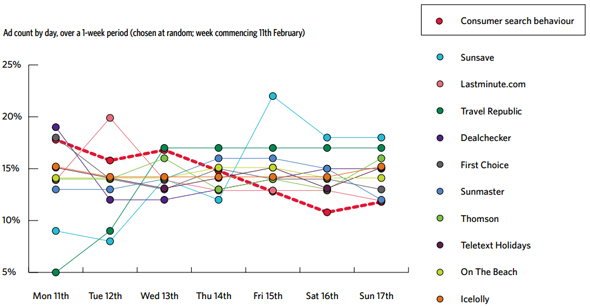 Over the weekend there were the fewest number of searches, with Saturday notching up the least. 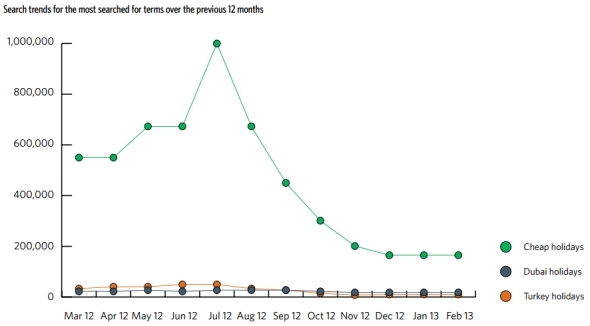 However come Monday, Greenlight’s research revealed how most holiday searches occur on Mondays. Greenlight’s Krishna Rao hypothesised that employees might be seeking escapism, having just enjoyed two days away from their desk on Saturday and Sunday. Dubai appears to be the most popular destination among would-be tourists. Search for volumes for ‘Dubai holidays’ and ‘Holidays to Dubai’ amounted to 26,000, which was a 7% share of holiday searches to long-haul destinations. As for the short haul, Turkey, Malta and Cyprus proved most popular. ‘Turkey holidays’ was searched for 9,900 times, whilst Malta and Cyprus both contributed 4% of all searches in Greenlight’s study. On The Beach appears to have been investing a lot in paid search media. It tops Greenlight’s charts for visible advertisers, paid media short-haul and generic holiday terms, beating high-street brands like Thomson and First Choice.